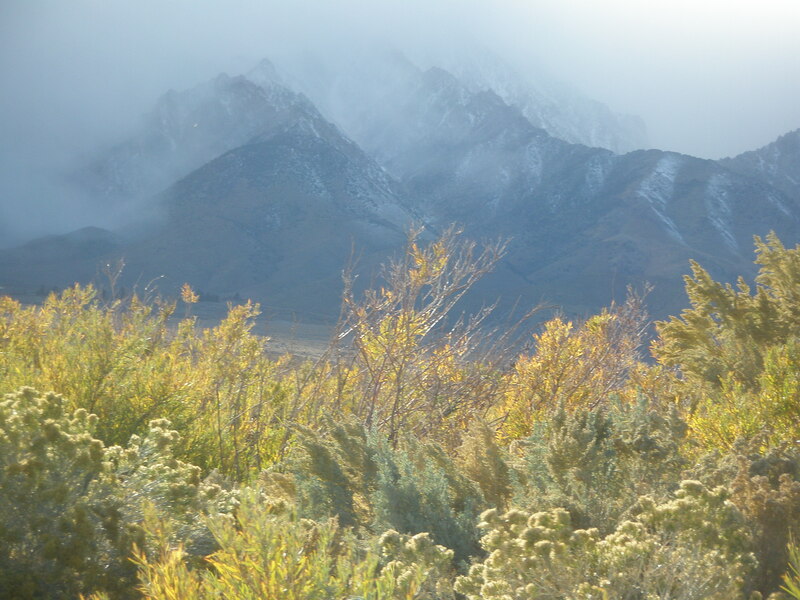 Like a mist of sifting powered sugar, the cloudbank of snow moves rapidly toward me from the Sierra Nevada in the west. I walk a deep sandy road on the edge of Manzanar, the Japanese American World War II relocation camp, located on California Highway 395, nine miles north of Lone Pine. Sixty years after the closing of the camp, I can clearly see foundation ruins of the tightly packed barracks that housed 10,000 people in this harsh desert landscape. The wind blows hard as the snow envelopes me, stinging my cheeks with the cold slap of winter. Have to get out of this wind! I turn up the collar of my heavy Carhartt jacket, pull the black fur Stetson hat tight upon my head and walk into a dense woods. The thick, overgrown foliage is Nature’s protection against the snow storm. I sit on the three-foot corpse of a fallen cottonwood to catch my breath. Boy, it is cold! I gaze at the winter woods and see old apple and pear trees, smothered by the new growth of desert willow and cottonwood. 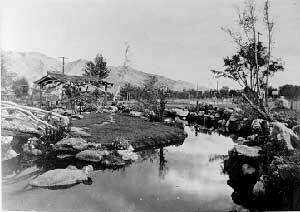 The fruit trees are survivors of the verdant orchards of the Manzanar of the early 1900s, before Los Angeles began to siphon off the precious Sierra snow melt into their aqueduct. I break off a scraping branch of cottonwood. A loud, cracking snap. It looks like dead wood, but I know these trees will be green again in June. I am catching my breath. The trees have walled off the wind and snow. I am going to need to spend some time here. Did you hear that? There is movement in the woods. The crunching of branches. I am not alone. Wind filters through the tightly woven strands of barren trees, sighing. Sighing. This land has a heaviness. Echoes of displacement. Spirits moving about like hungry ghosts with no one to remember them. Many of my Japanese-American high school classmates in Pasadena were tiny babies or infants wrenched from comfortable homes and brought to this desert place, where the fine alkali sand could not be kept out of the barrack housing and this same, sighing wind pressed against thin wooden walls and lifted up fragile roof shingles. Jeanne Wakasuki Houston remembers the day when her family was rounded up in Boyle Heights, CA, boarded buses at the Buddhist church in Los Angeles, and drove all day to the new Manzanar camp. “By the time we reached our destination….it was late afternoon. The first thing I saw was a yellow swirl across a blurred, reddish setting sun. The bus was being pelted by what sounded like splattering rain. It wasn’t rain. This was my first look at something I would soon know very well, a billowing flurry of dust and sand churned up by the wind through Owens Valley…..We drove past a barbed-wire fence, through a gate, and into an open space where trunks and sacks and packages had been dumped from the baggage trucks ahead of us. I could see a few tents set up, the first row of black barracks, and beyond them, blurred by sand, rows of barracks that seemed to spread for miles across this plain. P 247 The Illuminated Landscape, quoting from Farewell to Manzanar. My Pasadena High School classmates’ families lost businesses, homes and community roots. For four years, their families struggled in compressed, forced community, behind barbed wire and guard towers with machine guns, to recreate a life. When you visit Manzanar today, you enter through the old community hall, which is now a visitor’s center and museum. You walk through a simulation barrack residence and see life just as it was. What catches my heart every time I do this is the realistic cry of an infant. I look around at the visitors and I am sure there must be some mother with a little one crying for attention. But no. This is the recording of a baby crying. I imagine a young mother, holding and nursing her baby, as the snow pelts the tiny windows and seeps through the wood wall slats. The crying of the infant in the Museum display brings me back to another time, June 16, 1983. Our newborn son Erik was being held by my wife Jan as she sat on the sofa in our living room talking with her mother Evelyn who was visiting us. Something happened. A slight tremor through Erik’s body. Jan had 15 years of Emergency Room nursing experience and her instincts were aroused. Another very slight tremor. Erik was having seizures. The ten pound healthy boy was in trouble. The next day we were in PedICU at Children’s Hospital of Orange County. Jan had been up all night, and when I arrived, I saw an IV connected to a vein in his bald head. Erik has encephalitis, his brain is on fire and it hurts. When he wakes up he cries the cry of one in real pain. Any parent hearing this will find it unbearable. Jan and I hung together through a week in the hospital. Erik recovered and came home with minimal aftereffect, except, as we learned four years later, the Medical School resident did not do a simple, normal protocol test called a TORCH screen. That would have told us the viral cause of the meningitis. Exactly four years later, June 16, 1987, his little brain would catch fire again and our lives would change forever. I hear the sound of crying again as I sit on this cottonwood log in the woods of sighs and strange sounds of movement. I get up and begin to push my way through dense piles of branches and leaves, through gaps in the closely crowded trees. Hard, brittle sharp branches poke and prod at my Wrangler jeans. 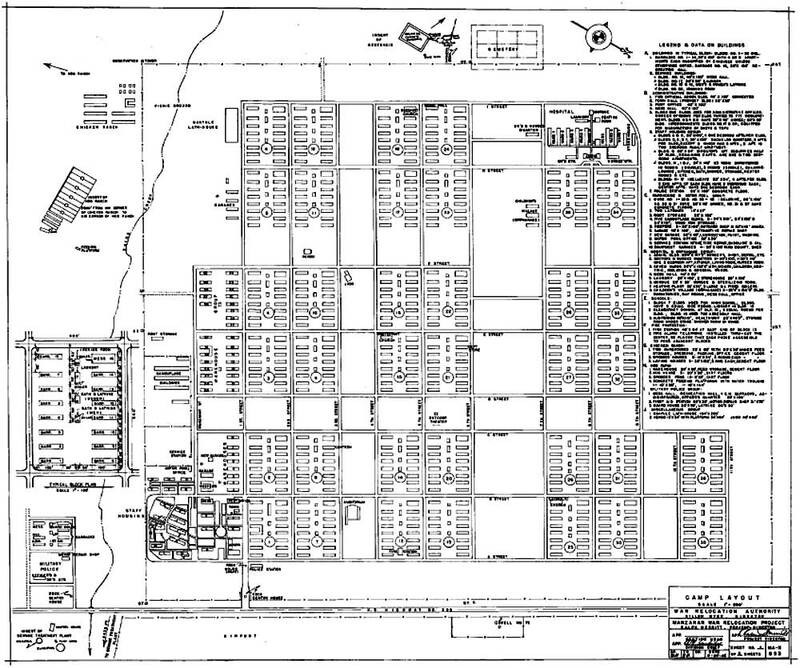 I imagine the visits the inmates of this relocation camp might have made into these same woods to get away from the congestion and crowds of people. Perhaps a teenage girl snuck out to be alone with herself from the tight controlling old country parenting. Because most of the first and second generation Japanese Americans would have been Shinto, I imagine many of them coming into this forest to pray. The Kami would be here. Shinto is the nature religion of the Japanese people. There is a mysterious power in nature. Shinto means “the way of the kami”, which can be divine beings, the spirit in a particular place, like a forest, or the spirits of the dead. Some kami are helpful; others can be harmful. How do we experience the Kami? I can become aware of the kami by seeing their effects in nature or by a feeling for their presence. Certainly, inhabitants of this camp must have walked where I am walking now, communing with the kami, praying for protection, or better, liberation and reunion with family back in Los Angeles. I am walking toward the distinctive sound of crying. As I move into the center of the dark woods, I am disoriented. A huge old tree hovers over me and I cannot see the mountains in the west. I guess by the direction of the sun and walk painfully through the scrapping brush toward the sound. And there it is. A piece of metal roofing (from the old barracks) may have been blown by an ancient wind high up into that old cottonwood tree. The metal bends and scraps against another tree: the crying sound. Suddenly a red blur races by my field of vision. As it has distance from me, it slows down. A bushy tailed red fox. A Japanese American walking and praying in these woods sixty years ago would have instantly recognized that fox as an incarnated kami, a messenger sent by the gods. However, this is one of the most feared kami, because the fox kami can possess people and cause illness and death to others. The fox darts a zigzag pattern under protective barbed wire toward the Manzanar cemetery to the west. A large white obelisk rises in the distance as the key memorial marker of those who died during the internment years. This monument was made by inmate stonemason Ryozo Kado in 1943. 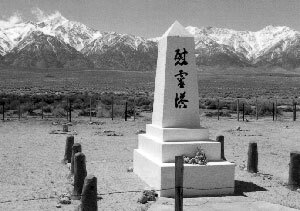 The front face of the stone marker reads “Soul Consoling Tower.”On the back of the monument is inscribed “Erected by the Manzanar Japanese. August 1943”. As I draw close to the cemetery to look at the stone tower I can see that it is decorated with strings of origami. Small stone memorials have been left along with children’s toys and several ceramic sake cups. The small cemetery has scattered graves. Circles of river stone outline the base of some graves. A few have concrete markers with the names of the deceased. Over there must be the grave of an infant, as I see a child’s sunglasses on a stone marker. Another grave is decorated with a barbed wire shaped heart, perhaps taken from a fence around the camp. Here the dead are remembered and loved. These beloved ancestor spirits are a form of kami. The inmates were removed from their own homes, where family altars maintained an ongoing connection with the dead. A photograph or some item personally connected to the deceased was placed on that altar. There would be burning incense and food offerings, because those spirits must be remembered or they become hungry ghosts. Obake are ghosts of restless spirits who have suffered injustice in this life, such as being removed from home and work and brought to live behind barbed wire in this desolate desert landscape. On the last weekend of April, every year there is an annual pilgrimage to Manzanar by descendents of the former inmates of the camp. This past April was the 43rd event. Former inmates and their families journey here, many from Southern California. Certainly some of my Pasadena High School alums must be among these families. The Manzanar Committee, which organizes this pilgrimage, refers to Manzanar as a concentration camp. This may upset you to read this, but that designation ties directly into the wording in FDR’s Executive Order 9066 that created the relocation camps. The events of the pilgrimage have become more numerous. Usually the UCLA Taiko Drummers perform a powerful cadence of ancient prayers. Films, lectures and testimonies of former inmates fill the weekend of remembrance. Because this annual pilgrimage and remembrance of the difficult life in this camp highlight the struggle for civil rights, recently the local Paiute tribal members and representatives of the Muslim community have participated as a presence of solidarity. This is a colorful gathering of Owens Valley Paiutes, the Muslim community and families of the former inmates. A concluding event of this emotional weekend is a memorial service at the Manzanar Cemetery. Christian, Jewish, Buddhist, and Muslim religious leaders participate. Most moving are the Shinto rituals for the dead performed by a Shinto priest. During the WWII years, the Shinto rituals were forbidden by the camp director. I invite you to visit the Manzanar National Historic Site. The best time for visit is between October and May, before the heat returns. After you go to the Visitor’s Center, you can secure a guide for driving the route around the camp. You will see a guard tower and several restored barracks. Archaeologists have resurrected ruins of the main buildings and the intricate network of waterworks and gardens that brought some serenity to the inmates during their life here. When you visit the cemetery, remember those who died and let us all remember what happened here, so that it never happens again. Farewell to Manzanar, by Jeanne Wakatusuki and James Houston. Shinto, C. Scott Littleton. Oxford: Oxford University Press, 2002. This entry was posted in Blog and tagged Ansel Adams, Japanese-American, Kami, Manzanar, Muslim, Owens Valley, Paiute, Relocation Camp, Shinto. Bookmark the permalink.